It would be pretty difficult for me to not enjoy a Spider-Man film, no matter how corny, overstuffed, or tonally inconsistent it may be. I found a lot to love about the third entry in Sam Raimi’s original trilogy despite the mediocre critical reception. And here we are nearly ten years later with another flawed Spider-Man film. And yet I can’t quite wrap my head around the complaints that are being thrown around. Perhaps I tend to be a glass-half-full person, but the film has spectacular effects (including arguably the best swinging scenes in any Spider-Man film), a terrific leading couple with nearly perfect chemistry (the delightfully likable and well-cast Andrew Garfield and Emma Stone), and a couple of standout villains that perfectly capture the tone and style of the comics in which they’re based. “The Amazing Spider-Man 2” finally deals with more of Peter Parker’s past – finally revealing why and how his parents were killed. It’s not the film’s most fascinating story, but it does beginning with a pretty spectacular Spider-Man-less opening airplane sequence. Then enter Parker (Garfield ) as he battles a Russian bad guy played by Paul Giamatti. It turns out he’s not really Spider-Man’s main rival though. 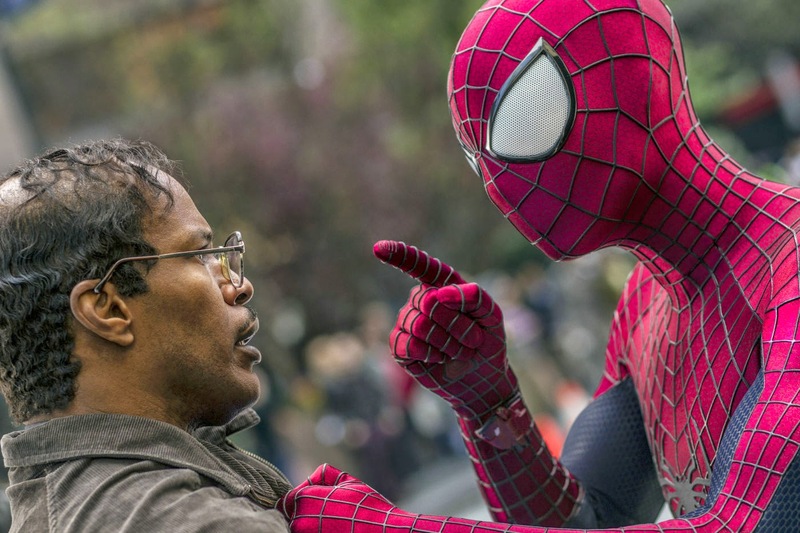 Lonely Oscorp employee Max Dillon (Jamie Foxx) who becomes obsessed with Spider-Man after being rescued by him, loses the last few loose screws he has when he’s nearly killed in an accident involving electric eels. Say hello to Electro. He ends up with a cool electronic voice and a shape shifting blue hue and he can now travel via electric circuit which certainly comes in handy when it comes to the horrible NYC traffic. Then there’s Harry Osborn, a staple of the original trilogy, now played wonderfully here by “Chronicle’s” Dane DeHaan. The actor’s creepy “Leonardo DiCaprio as coke head” look definitely works in the guy’s favor as the character learns he’s inherited not only his rich father’s money and business but his fatal genetic disease as well. Eventually his storyline and Max’s storylines meet up as they join forces, as comic supervillians tend to do, against Spider-Man. What can I say? I was certainly enthralled with this Spider-Man entry. The flying scenes through New York’s highrises are simply outstanding. Director Marc Webb uses some pretty cool shots, many of which are point-of-views. Definitely the best shots any of these movies have offered so far. These sequences are paired with Spider-Man newbie Hans Zimmer’s soaring score. But Webb really shines when it comes to his two leads. The “(500) Days of Summer” helmer really knows great chemistry when he sees it and is great at directing actors. You get a real sense of the angst with Peter, and Stone as his love Gwen Stacy is simply topnotch. A shocking (yet not all that shocking) third act development was emotional and moving and simply exquisitely handled. And who could write a review for this film without mentioning the great Sally Field? She’s a great Aunt May. "Trailer" for The Amazing Spider-Man 2 on TrailerAddict.